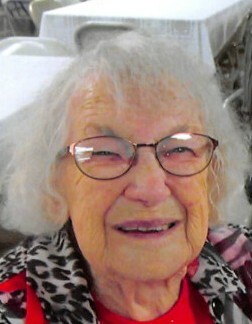 Elayne A. Fahlgren, age 93, resident of Ortonville, MN, died on Sunday, January 13, 2019, at Ortonville Area Health Services in Ortonville, MN. Funeral services will be held on Wednesday, January 16, 2019, at 2:30 PM at the Fairway View Community Orpheum. Visitation will be held one hour prior to services. Pastor David Tonn will officiate, and burial will take place at Mound Cemetery at a later date. Elayne Anetta (Strohl) Fahlgren was born on August 25, 1925, in Bismarck, ND, to George and Gertrude (Sundstrom) Strohl. She was one of three children. She attended school and graduated from high school in Washburn, ND. Elayne was united in marriage to Melvin “Kelly” Fahlgren on January 18, 1947. They were blessed with two children: Lee and Lynne. In 1955, Elayne moved with her family to Ortonville. She held numerous occupations, most recently as the Activity Coordinator at Northridge Residence (a position she held for almost ten years). Elayne was a longtime member of First English Lutheran Church and served in many capacities. She was a Sunday school teacher, Altar Guild member, and served in many church circles. She was also was very active with the Big Stone American Legion Auxiliary, serving as president for 12 years. She also enjoyed bowling league, gardening, baking, and cooking (especially trying new recipes). She was an avid reader and many times would read an entire book in one day. Elayne is survived by her children: Lee Fahlgren of Ortonville, MN; and Lynne Mackey of Memphis, TN; sister, Mavis Baranyk of Bismarck, ND; grandchildren: Eric and Kyle of Drummonds, TN; and Kelsey of Memphis, TN; great-granddaughter, Melanie; many numerous nieces and nephews; and many other family members and friends. She was preceded in death by her parents; husband, Melvin “Kelly” Fahlgren; sister, Iolha Arner; and brothers-in-law: DuWayne Baranyk, and Glen E. Arner.